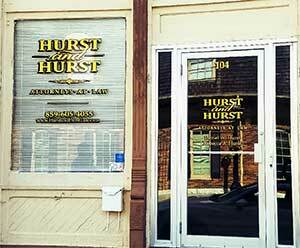 Hurst & Hurst provides you a wide range of legal and mediation services. We understand the vital importance of the outcome of your legal matter to you and your family and we are committed to providing you with quality, competent representation. Contact us if you have any questions or legal issues you need to discuss. Our Danville offices are located on the second floor of a lovely historic building in Downtown Danville, Kentucky. Although the second floor is not handicap accessible, we do have accessible meeting space available. Please let us know if you require accommodation when you call and we will be happy to meet your needs. Our Harrodsburg offices are located in downtown Harrodsburg, Kentucky. To speak with one of our attorneys, please call (859) 209-2101. Our consultations are always free and do not obligate you in any way. We are here to help. We urge you to seek legal representation as soon as you become aware of a possible need for legal services since this can often prevent costly complications. For a thorough appraisal of your case and an explanation of the options available to you, or if you have any questions or concerns, call us and we will schedule a free legal consultation for you. There is no obligation to work with us following your free consultation and the information you receive during that consultation may be helpful. Feel free to visit our legal resources page if you need additional and/or general legal information. Please enter your message to Hurst and Hurt Law in the box below. Check the captcha field and click the submit button. 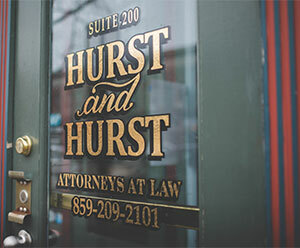 Thank you for contacting Hurst and Hurst Law.